Prachi Chaudhari uses totally Indian flavors to make her Mathri Tartlets and Vol-Au-Vents recipes for the "Pies and Tarts Week" Showstopper bake. Mathri is an Indian snack made of a seasoned and crumbly dough. 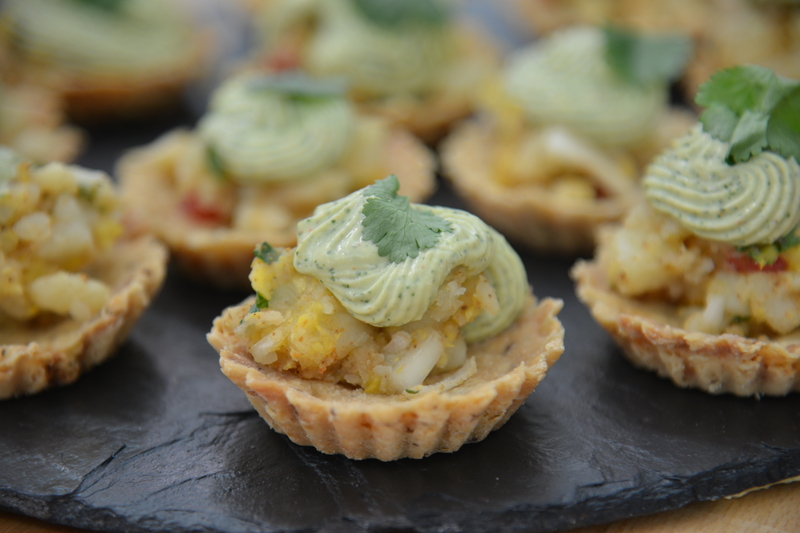 Prachi combines a mix of spicy potato and mango that will be placed in the Mathri tartlets. 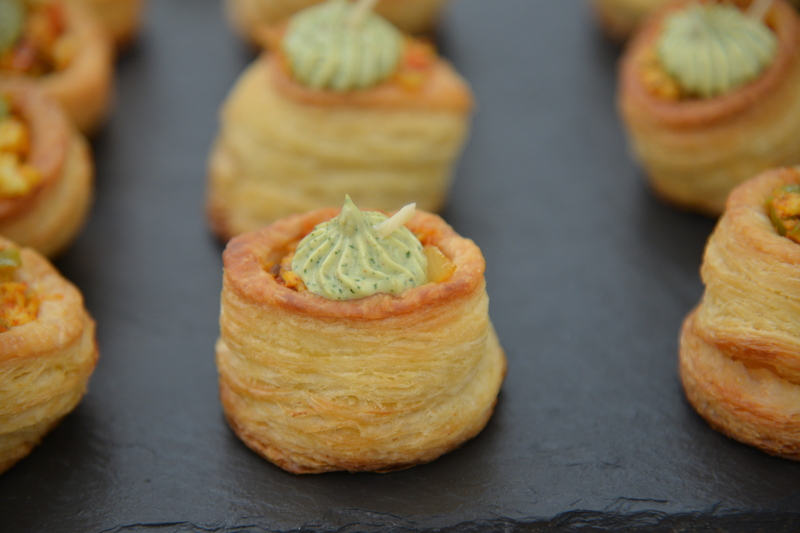 Her Vol-Au-Vents made with puff pastry will have an aromatic paneer and avocado cheese filling. Watch the full episode of "Pies and Tarts Week" from Season 2 Episode 4 of The Great American Baking Show to find out if her bake impresses the judges or if it crumbles under pressure. 1. In a mixing bowl, mix the butter, carom seeds, cumin seeds and all-purpose flour with the fingers until mixture resembles bread crumbs. 3. Wrap the tart dough in plastic wrap and refrigerate it for 30 mins. Divide the dough into equal small balls. 4. Roll each ball and fit in tartlet shells. 5. Prick the base of the shells and place it in the fridge for 5 mins. Use small aluminium foil pieces and place in each tartlet fill it with pie weights or dried beans. 6. Preheat the oven to 340F (170C) and bake for 20 mins or until golden brown. 7. Remove from the oven carefully remove the shells from the metal. 8. Let it cool, fill it with filling and top it with avocado crema, place a leaf of cilantro on each. 1. Sift the flour and salt onto the cold cubes of butter. Using a pastry cutter, cut the butter into the flour. 2. Work until you have a crumbly mixture. Flatten any large chunks of butter with just your fingertips. Add the ice-cold water a little at a time to loosely bind the dough. Mix the dough with the pastry scraper until it just hangs together. 3. Shape the messy, shaggy dough into a rough rectangle and roll it out until it's 1/2 inch thick. 4. Use the bench scraper to fold the dough in thirds like a business letter. 5. Turn the package of dough 90 degrees so the folds run vertically. Square off the edges of the dough as you work. 6. Roll the dough into a rectangle that's 1/2 inch thick, always rolling from open end to open end. Continue rolling, folding, and turning until the dough looks smooth. By four or five "turns," the dough should hang together well. 7. For even more layers, fold the smooth dough up like a book. To do this, fold the two shorter sides into the center and then fold the dough like a book. 8. Brush off excess flour as you fold. Wrap the dough and chill it for half an hour before giving it two final turns. At this point, use bench scraper and cut the dough into 5 equal parts (rectangle shape), wrap it in saran wrap and give another 10 mins short rest in the fridge. 9. Remove 1 part (one at a time) from the fridge and roll it into a rectangle, take the medium round container and trace a circle, make as many circles. 10. Again take medium round and place small round within, this way remove the outer ring formed, this will be used as border of tartlet. 11. Place each prepared round on parchment paper and prick the bottom use egg wash and brush it at the rim, place the border of puff pastry on it. 12. Let these rest in fridge for 2 mins. 13. Preheat oven to 425F (218C) bake them for 20 mins or until golden brown. 14. Remove from the oven let them cool on wire rack, fill them with filling and top it with sauce, garnish it with slivered almond. 1. Combine avocado and Greek yogurt in the bowl of a food processor. Process for 1 minute until smooth and creamy, scraping down the sides of the bowl half way through. 2. Add remaining ingredients and process again for 2 minutes until very smooth and only tiny bits of the cilantro are visible. 3. Transfer to airtight container until use. 4. Add more half and half to dilute. 1. In a bowl mix all the ingredients. 2. Spoon it in the tartlet. 1. Take a nonstick pan add oil, cumin seeds, onion, grated ginger and garlic, sauté for 2 mins. 2. To this add chopped green bell pepper, mix for 2 mins, add tomatoes, turmeric powder, red chilli powder, pav bhaji, garam masala and salt. 3. Now add crumbled paneer and keep mixing for couple of minutes till mixture dries out add kasoori methi and cilantro.